Let it snow, snow, snow! 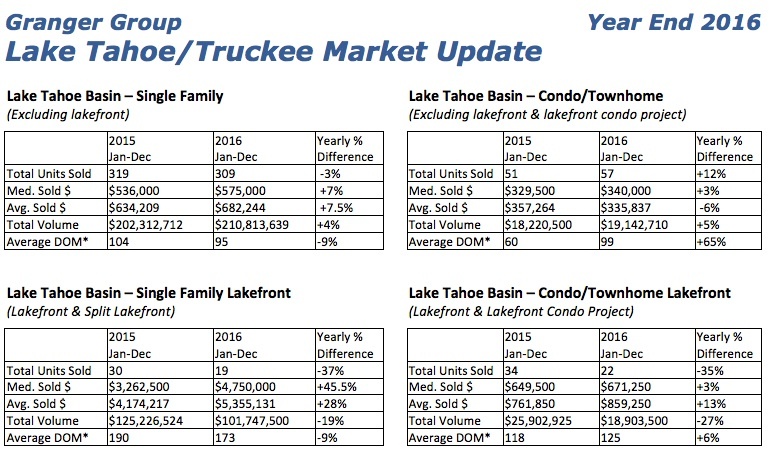 There is an energized vibe around Tahoe-Truckee right now and it’s not just from the great start to winter, but also because 2016 Lake Tahoe real estate generated some incredible numbers! Check out the Year-End 2016 stats. Mother always said to start off on the right foot, so let’s Kangaroo Flip into the ski area numbers. Single family home sales were up a whopping 105% over 2015, with the average sold price up 27%…cowabunga! 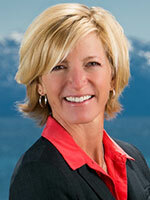 Ski area condos/townhouses also increased in units sold by 51% and total volume was up 53%. It’s fantastic to see this upsurge and we are confident that 2017 will continue the trend. Sellers planning to list in 2017 will be happy to hear that Lake Tahoe Basin SFR’s saw a healthy 7% price increase in 2016, so even though unit sales were down 3%, the year still closed out with total dollar volume up 4%. Also, average Lakefront SFR prices shot up by 28%! As is common with big price jumps, unit volume on Lakefront SFR & Condo sales was down 35-37%. This trend makes the ski area numbers that much more impressive. Truckee and Incline Village also produced positive numbers in 2016 over 2015. Incline saw an increase in SFR units sold of more than 10%, with a rise in total volume of over 15%. Truckee showed a similar number in SFR units sold with an increase of 12%, a growth in total volume by over 37%, and 12% less days on the market. Truckee sale prices are up too, and as I mentioned in my last newsletter, Martis Camp can take a lot of the credit for the big Truckee numbers.